As we move towards the close of 2015, our thoughts go back to a very unusual event that took place on this day in London, on New Year’s Eve 1853. To help promote the permanent exhibition at Crystal Palace where the huge, concrete prehistoric animals designed by Benjamin Waterhouse Hawkins under the scientific direction of Richard Owen were to be put on permanent display, a very peculiar dinner party was held. Twenty-one leading academics and notable persons of the day held a New Year’s Eve dinner inside the belly of the Iguanodon, the largest of the Crystal Palace exhibits that had been commissioned. Eleven of the guests could be seated inside the animal, the remainder were sat at an adjacent table. Even the invitations to the eight course banquet had a prehistoric theme. The guests (all men) included Richard Owen, he was seated at the head of the table, in the skull of the Iguanodon, as he was regarded as the “brains behind the project”. Naturalist, geologist and the President of the London Geological Society Professor Edward Forbes attended along with eminent geologist Joseph Prestwich and other well-known scientists at the time. Also in attendance were investors in the Crystal Palace Company and newspaper editors, we suspect in order to maximise the media coverage this event would receive. A stage was erected around the giant reptile and from the newspaper accounts it seems that the evening became quite raucous with much drinking and singing. Mounted on plaques around the huge beast were names of prominent scientists of the day who had all played a role in the understanding of the Dinosauria, Georges Cuvier, William Buckland and of course Richard Owen were honoured. Gideon Mantell, who had passed away a year earlier also had a plaque. Richard Owen was an ambitious man who was quick to exploit developments to suit his own ends. On numerous occasions he belittled the work of his contemporary, he even took credit for a number of Mantell’s discoveries. This evening was no exception. Richard Owen, whose own contribution to the nascent science of palaeontology has been well documented, chose this occasion to take full credit for the study of Iguanodon. The model of the Iguanodon used in the banquet is under the scaffolding. It was Gideon Mantell who named and described Iguanodon and his insight and reconstruction proved to be much more accurate than that of Owen’s. For example, Mantell insisted that the forelimbs of this dinosaur were much smaller than its hind legs, but Owen still recreated Iguanodon with four column-like legs of roughly equal size. Although much is known about the meal itself, thanks to the illustrators from various newspapers who sketched the scene, debate remains as to exactly where the event was held and indeed, just what the eleven guests inside the “belly of the beast” sat in. Was the final model used, or the mould to recreate the model press-ganged into service as a makeshift restaurant? Perhaps, both were utilised, the final model sat snugly in its mould jacket with portions of the finished beast on display. Take a look at the illustration from the Illustrated London News above, the head of the Iguanodon shows lots of skin texture, whilst on the side of the body there is none. Perhaps the head of the final model was exposed for the evening with the rest of the enormous replica still encased in its mould. Wines: Quite a selection including – Sherry, Port, Madeira, Moselle, Claret and from contemporary reports it seems that a number of the party became exceedingly drunk and boisterous. On behalf of everyone at “Everything Dinosaur” we wish you a happy New Year, wherever you are celebrating, even if you are dining inside a giant dinosaur! Today, we continue our countdown of the top ten prehistoric animals for 2015. This chart is compiled from various data, such as questions asked by school children during our dinosaur workshops, email requests for fact sheets, product sales, on line comments, blog article views and so forth. Having crunched the numbers we have listed our top ten. Now, for that all important top five! Down one place this year, the armoured dinosaur Stegosaurus. This was a favourite amongst Year 1 and Year 2 children with lots of Stegosaurus themed drawings sent into our offices from young dinosaur fans. The popularity of this dinosaur was also boosted by the “Sophie Stegosaurus” exhibition which began this year at the London Natural History Museum. Stegosaurus and “Sophie” also featured in a number of news stories we covered over the last twelve months. Still lots to learn about this Ornithischian dinosaur. A slight fall this year for Triceratops, although “three horned face” still ends 2015 as our highest ranked Ornithischian. Ironically, Triceratops benefits from the discovery and scientific description of other ceratopsids. Each time a new Ceratopsian is named or new fossils found, these fossils, almost inevitably, get compared to the most famous of all the horned dinosaurs. This year has been another boom year for all things Ceratopsian (actually for the Marginocephalia* clade as a whole) with lots of new horned dinosaur discoveries such as Wendiceratops and Regaliceratops. * Marginocephalia (fringed heads” includes the Ceratopsia and the Pachycephaliasauria). An imaginary dinosaur makes our top five, the first time this has happened since we started compiling this annual list. Originally referred to as Diabolus rex, this huge meat-eating dinosaur proved to be a big hit especially with young dinosaur fans after it starred in the film “Jurassic World”. Such was the hyperbole surrounding this genetically engineered dinosaur that last year, even before the film came out it entered our top ten (number nine). It climbs six places this year to finish in the top three. Retaining the position of runner-up is Velociraptor. This dromaeosaurid proved popular across a wide range of categories. It was helped by the Velociraptor pack that featured in “Jurassic World”. We should give a vote of thanks to Echo, Charlie, Delta and Blue – the names of the “raptors” from the film. The introduction of the highly collectible set of three hatching Velociraptor chicks from Rebor also boosted this dinosaur’s popularity. The Rebor hatching Velociraptors figure is a limited edition sculpt, only 1,000 models were made, the Rebor range has certainly proved to be a big hit amongst serious dinosaur model collectors. Introducing “Lock, Stock, and Barrel”. With the introduction of more Velociraptor models next year, look out for two from Papo for example, we think that Velociraptor is almost certain to remain in the top five. Just before we reveal our number one, time for some honourable mentions. Spinosaurus finds itself just outside the top ten this year, quite a fall for Spinosaurus which was a number five in 2014. Sales of the three new CollectA Spinosaurus models helped but Spinosaurus ends the year just out of our top ten. Smilodon was a high climber amongst the prehistoric mammals and the top ten list in general, as was the pterosaur Dimorphodon. This Early Jurassic flying reptile’s popularity was down to its appearance in the film “Jurassic World”. Topping the charts once again is the “tyrant lizard king” – Tyrannosaurus rex. This dinosaur remains a perennial favourite amongst school children, dinosaur fans and model collectors. Once again we saw a peak in T. rex popularity over the summer months which we attributed to its role, albeit quite a restricted role in the film “Jurassic World”. A confident prediction, since it is that time of year when many pundits look ahead, expect Tyrannosaurus rex to have a role in the sequel which is due out in 2018 (June 22nd 2018). The introduction of a beautiful feathered T. rex model from CollectA also helped to keep this fearsome Theropod firmly at number one. We even supply a roll of cardboard with every model! With “Jurassic World” having dominated the cinemas, well, at least until a certain film came out a few days ago, it seems fitting that we should end our annual review of the top ten most popular prehistoric animals of 2015 with a picture of Tyrannosaurus rex from the film. Scarred but still number 1! As 2015 draws to a close, staff at Everything Dinosaur have the opportunity to reflect on all the new dinosaur and prehistoric animal discoveries made over the last twelve months. In addition, we have been busy compiling our top ten prehistoric animals of 2015, an annual survey that takes into account all the fact sheets sent out, drawing materials requested, views on website pages, blog views, comments, emails and product sales. We have also included data from our dedicated schools website and all this information has been brought together to create our list of the ten most popular prehistoric animals. Here is the first part of the countdown, from number ten to number six. Making a welcome return to the top ten is the pterosaur Pteranodon. It has been a good year for Pterosaurs generally with the likes of Quetzalcoatlus and Dimorphodon doing well. We suspect this was due in part to the fairly prominent role played by pterosaurs in the summer blockbuster “Jurassic World”. This is not the first time that record breaking film will be mentioned in this compilation. However, the popularity of pterosaurs in 2015 can also be explained by a number of new flying reptile discoveries, such as the fearsomely fanged Triassic pterosaur recently described. The introduction of the beautiful (and quite large) Guidraco pterosaur model also helped to boost the popularity of the Pterosauria. Model has an articulated jaw. Down one place from last year, the only mammal in our top ten, the enigmatic Woolly Mammoth. The Sabre-tooth cat was listed in our top twenty, once again helped by the introduction of a CollectA model, but the only representative of the Mammalia in our top ten for the second year running is Mammuthus primigenius. The Woolly Mammoth’s popularity was maintained in part by news this year that the genome of this iconic Ice Age creature had been sequenced. Down two places from last year, Brachiosaurus is at number eight in our countdown. It is the only Sauropod in the top ten list, although both Diplodocus and Apatosaurus were climbers this year. 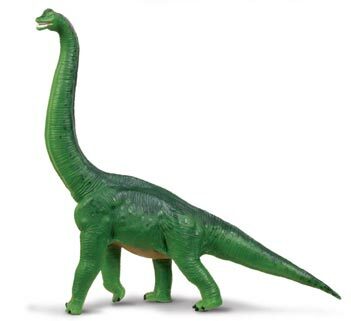 Brachiosaurus is the first dinosaur to be listed in our chart. The top ten remains dominated by the Dinosauria. The biggest climber this year is Mosasaurus. It enters our top ten list for the first time. Marine reptiles only rarely make the top ten, for example, Dolichorhynchops was at number ten when we completed this exercise in 2012. The reason for the popularity of Mosasaurus, quite simply “Jurassic World”. 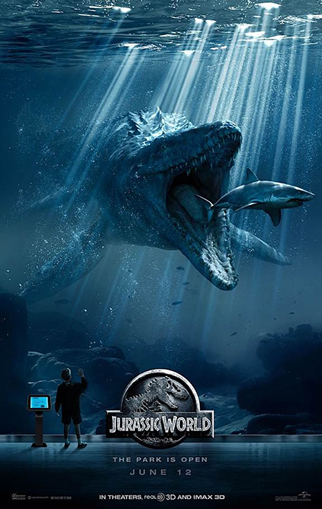 One of the best scenes in the whole movie was the Mosasaurus feeding time. We won’t mention what else happens to Mosasaurus, just in case blog readers have yet to see the film, suffice to say, that Mosasaurus plays quite a role in the unfolding action. As a result of “Jurassic World” Everything Dinosaur has experienced a record year for Mosasaur model sales, with several models selling out many times over in the last six months or so. Up two places from last year is Giganotosaurus. This dinosaur, (the name means “Giant Southern Lizard”), proved to be particularly popular amongst school children. We had lots of requests for fact sheets and drawings of this large carnivore. This helped boost this South American dinosaur’s popularity. In addition, new models by Schleich and the inclusion of a Giganotosaurus in one of the new model sets by CollectA kept dinosaur model fans happy. Well painted model has an articulated lower jaw. Giganotosaurus brings to a close the first part of our top ten countdown for 2015. We will post up in a couple of days that all important top five. Ask any young dinosaur fan to tell you some facts about the body of Tyrannosaurus rex and you can bet that after that huge skull, powerful bite, and those awesome teeth are mentioned, a comment will be passed regarding those very short arms. New research published this month in the academic, on line journal PLOS One puts the forelimbs of the Dinosauria centre stage, the study conducted by scientists from Fayetteville State University (North Carolina) and South-east Missouri State University suggests that the position of the arm bones in many museum reconstructions, the front legs of many a dinosaur model may be wrong. The study does not pretend to be the last word on dinosaur limb placement, but it does point out that a number of museum exhibits have different reconstructions amongst mounted dinosaur skeletons. The picture above shows two articulated specimens of horned dinosaur, both Centrosaurines. The research team only used dinosaurs that had specimens which had been preserved in articulation. In this way, the resting pose of the shoulder blades (scapulae) and the forelimbs can be summarised without having to be too concerned with distortion or extensive crushing which may have resulted from the fossilisation process. The photographs show that the ceratopsid sacrum (vertebrae over the pelvis) is horizontal, that is parallel with the ground when the humerus is held horizontally. As both specimens in the picture above are shown in right lateral view (viewed from the right side), we have outlined the approximate position of the right humerus, it can be seen to be held almost horizontal. The black line through the long axis of the sacrum is sub-parallel with the line that serves as a proxy for the horizontal by connecting the tips of the metapodials (the long bones in the hand) of the right forelimb (with the horizontal humerus) and a line drawing showing the right rear leg re-positioned to simulate a normal standing pose. The lead author of the research biologist Phil Senter (Associate Professor in the Department of Biological Sciences, Fayetteville State University, along with is co-collaborator Professor Jim Robins, used their own photographs of mounted skeletons in combination with museum figures to analyse the correct angle of the resting position of the shoulder blades, the coracoid and the front limb bones. In addition to selecting only articulated individuals to study, the scientists studied those animals that were preserved lying on their sides and for each of the animal’s included in the study the front limb joints had to be preserved in an articulated state, providing as much information as possible with regards to their position when the animal was alive. Basal Ornithopods, early Theropods and dinosaurs close to evolutionary split into Aves (birds) were included in the research. Although the focus was on bipedal dinosaurs, facultative bipeds such as Edmontosaurus and Parasaurolophus were included in the genera examined. The long axis of the scapular blade (shoulder bone) was found to be most horizontal in bipedal Saurischians, most vertical in basal members of the Ornithopoda, and intermediate in Hadrosauroids. Included in the limb position study. The research suggests that in bipedal dinosaurs other than Theropods with semi-lunate carpals (semi-lunate carpals are unique in the Maniraptora which include dinosaurs such as Velociraptor, Microraptor, Oviraptor, Khaan and Caudipteryx), the resting position of the elbow is close to a right angle and the resting orientation of the wrist is such that the hand exhibits little deviation from the rest of the arm. However, in the Theropoda with those more flexible wrists (thanks to the semi-lunate carpals), the elbow and wrist are more flexed at rest, with the elbow at a more acute angle and the wrist approximately held at ninety degrees. The model in the picture shows the proposed configuration (inset). Whilst this may not be a definitive study, due to the relatively low numbers of skeletons assessed, it does have significant implications for the curators of dinosaur collections in museums aiming to mount an anatomically correct exhibit. It may be time to re-adjust those forelimbs in order to better reflect this interpretation of the fossil record. Two soft toy dinosaurs for the price of one, now that sounds like quite a bargain. It’s exactly what you get with these very cleverly designed dinosaur Switch-A-Rooz. Simply turn the T. rex inside out to reveal a Triceratops or should that be turn the Triceratops inside out to make the Tyrannosaurus rex soft toy appear. If you aren’t quite sure what we mean, the helpful elves at Everything Dinosaur have made a short, forty second video that shows the dinosaur Switch-A-Rooz in action. We are reliably informed that the Triceratops soft toy is called “Rocky” and the Tyrannosaurus rex is called “Rex” (we should have been able to work that one out ourselves). Suitable for children form three years plus, these dinosaur Switch-A-Rooz give soft toy dinosaurs a new “twist”. Do you turn T. rex into Triceratops or Triceratops into a T. rex? Can you decide? The soft toys stand just a fraction under twenty centimetres high and they are made from super-soft material which can be sponge cleaned if required. These reversible stuffed Late Cretaceous dinosaurs will really help to inspire creative play amongst young palaeontologists. We couldn’t decide which one was our favourite. They certainly make a perfect pair, two soft toy dinosaurs for the price of one. Give Triceratops a twist and watch him transform into a Tyrannosaurus rex called Rex. Switch-A-Rooz dinosaurs, a dinosaur double-act which provides a pair of prehistoric plush. Two soft toy dinosaurs for the price of one. As 2015 draws to a close, after all, this time next week it will be 2016, team members at Everything Dinosaur have been reviewing a paper published in the most recent issue of the “Journal of Vertebrate Palaeontology” (we can’t bring ourselves to use the “Americanised” spelling), entitled: “The postcranial skeleton of Galecyon: evidence for morphological and locomotor diversity in early Hyaenodontidae (Mammalia, Hyaenodontida)”. Exactly one hundred years ago the fossil bones of an Early Eocene carnivorous mammal were scientifically described. The fossils, including skull bones, jaw fragments and teeth were between 55 million and 50 million years of age and demonstrated an early radiation of the Mammalia towards larger predators after the demise of the Dinosauria. Subsequently the fossil bones were assigned to the genus Galecyon and a number of species have been erected for example, Galecyon mordax (the name translates from the Latin as “biting polecat dog”- we think). In this newly published paper, scientists from the University of Arizona in collaboration with colleagues from The Johns Hopkins University (Baltimore, Maryland) were able to pull together a number of Galecyon fossil finds, including limb bones and from this study they have concluded that this fox-sized hunter was on the way to becoming a fully terrestrial carnivore. An artist’s rendition of the shape of Galecyon, with its fossilised bones laid out anatomically. Background shows fossil formation, right humerus (inset). The picture above shows a silhouette of the Early Eocene carnivore with the fossil bones used in the study placed in the correct anatomical position. The Willwood Formation of Wyoming (southern Bighorn Basin), the location where the majority of the Galecyon material come, from is shown in the background. The enlarged bone featured is the right humerus (upper arm bone). From the subsequent analysis of the limb bones, the researchers were able to deduce that Galecyon was better adapted to a cursorial, terrestrial existence than its contemporaries which showed anatomical adaptations more akin to a climbing (scansorial) habit. Prior to the evolution of the mammalian order Carnivora (the carnivores), which includes cats, dogs, seals, walruses, bears and raccoons, North America was dominated by group of primitive meat-eating mammals called hyaenodontids. This group of placental mammals, in turn, have their origins in the Palaeocene Epoch. Fossils, particularly teeth are relative common in Wyoming but other material, especially postcranial material is exceptionally rare. Using a recently discovered more complete specimen and other referred material, the authors were able to piece together a better idea of how Galecyon moved. This helps to provide a better understanding of how the hyaenodontids were evolving. Weighing between five and seven kilogrammes, Galecyon was only about the size of a European Red Fox (Vulpes vulpes) and the fossil limb bones show that it was not entirely scansorial (tree climbing), like some of its hyaenodontid Early Eocene contemporaries. Nor was it a fast runner like some of the later hyaenodontids such as those genera that flourished in the Oligocene. However, the team were able to infer locomotory abilities and show progression towards a more agile, pursuit predator existence. For Galecyon itself, this new research suggests it was the Early Eocene equivalent of a skunk or a wolverine. The postcranial material also allowed the researchers to explore the evolutionary relationships between different hyaenodontids. Teeth are the most common parts of the skeleton found, so dental characteristics can be investigated, but the new specimen allows for other additional parts of the skeleton to be studied too. Just time to say on behalf of everyone at Everything Dinosaur we wish you all a Merry Christmas and a Happy New Year. Team members will soon be tucking into their avian dinosaurs (turkey) and so forth but we thought we would post up today a seasonal message from all of us. In the next few days we shall finish compiling our list of the top ten prehistoric animals for 2015 and in addition, we have to sort out some palaeontology predictions for 2016. Our aim is to keep blogging and to post up at least one dinosaur, prehistoric, animal or fossil themed post a day, as well as to keep putting up helpful articles on this blog’s sister site which is dedicated to our work in schools. On that note, we must also start planning for the spring term, one that looks like it is going to be the busiest on record for our teaching team. Team members at Everything Dinosaur are working up to the late afternoon of Christmas Eve. We have blog posts to finish for museums, a teaching resources article to complete and the warehouse needs a quick tidy up before Santa drops in. We will also be monitoring the emails to deal with any customer queries should any arise. In addition, we shall be keeping a listen out just in case we get any last minute phone calls. As for the office and our working arrangements over the Christmas period, we shall of course, be taking a well earned break. However, team members will be on hand throughout the majority of the holiday season to make sure that emails and other correspondence are answered promptly. Even members of the Thyreophora celebrate Christmas it seems. Once the festivities are over, we shall be commencing our annual stock take. This is a bit of a tradition and the task is made bearable thanks to lots of hot coffee, mince pies and a few savoury morsels to keep us all going. Undertaking an inventory of our product range and fossil collection is quite an onerous task, we have thousands of products and lots and lots of fossils, even though this year we have given away a great many of our smaller specimens to schools and other institutions as part of our work in schools. Speaking of which, January is going to be yet another record breaking month for our dinosaur workshops in schools. We are going to have so much fun working with all the school children. Everything Dinosaur and teaching work in schools. New Models from CollectA, Papo, Rebor Safari Ltd, Schleich etc. 2016 will see us once again expanding our product range with lots of new dinosaur models and replicas. Only this morning we were telephoned by one of the senior managers at Papo, he wanted to tell us how excited he was after having seen the new Papo prehistoric animal models that are due out next year. In particular, he was “bowled over” by the new Papo Baryonyx replica that is going to be in stock at Everything Dinosaur sometime in quarter 1. Papo Baryonyx dinosaur model – available early 2016 from Everything Dinosaur. We have some interesting new additions to our portfolio so check out our Facebook page, social media and this blog for exciting announcements in the next few weeks. Over the next few days we shall also be finalising our palaeontology predictions for the year ahead, as well as looking back on the predictions we made this year. In addition, we have our annual list of the most popular prehistoric animals of 2015 to compile, given all the dinosaur sales, letters, pictures and fossil photographs we receive this will take some calculating. That’s enough about the future, just time to return to the present and to wish all our customers, supporters, followers and fans a Merry Christmas. Most complex life on Earth, that is organisms that have evolved beyond the unicellular stage, depend on oxygen. Fundamentally without O2, life on our planet would be very different, for one thing this highly reactive element is needed before amino acids and hence proteins can form. Every breath you take reinforces the importance of oxygen to our planet’s great diversity and variation of life. However, when did the oxygenation of our planet begin and how quickly did oxygen build up on Earth to allow complex life forms and more complicated ecosystems to evolve? “Snowball Earth” – progressive oxidation. A new study published in the academic journal “Nature Communications” carried out by a team of international scientists, including researchers from University College London, Leeds University and the University of Washington, suggests that it took around 100 million years for oxygen levels in the atmosphere and oceans to rise to a level that allowed a rapid increase in the diversity and variety of life on Earth. This research, that involved analysing selenium isotope concentrations from seven different locations, indicates that there was not a steady and sustained rise in O2 levels over this period, oxygen concentrations fluctuated, the amount of O2 increased in fits and starts leading to a substantial increase in life around 600 million years ago. Which Came First More Animals or More Oxygen? One of the fundamental questions that the scientists sought an answer to in this Natural Environment Research Council funded project was this – did rising oxygen levels permit the explosion of animal life recorded in the fossil record from about 600 million years onwards or was it a change in animal evolution that kick-started the rise of oxygen? Did rising O2 levels lead to an expansion in complex animal life? Did an expansion of more complex animal forms give rise to greater levels of oxygen? This research suggests that the rise of O2 began significantly earlier than previously thought and the increase of oxygen was not a linear one, O2 levels rose, stalled and rose again over a vast period of geological time (at least 100 million years). If the conclusions reached by the scientists are correct, then it is likely that early animal evolution was kick-started by an increase in the amount of oxygen available, rather than a change in animal behaviour leading to greater levels of O2 in the atmosphere and oceans. To gain a better understanding of Earth’s climate during the Neoproterozoic (that vast era of geological time from about a billion years ago to 542 million years ago), the international team of scientists analysed selenium isotope data retrieved from samples of marine shales laid down at the bottom of the sea at different times from seven different locations to piece together a global picture of oxygen levels in the oceans and the atmosphere. Strata studied included rocks across the United States, China and Canada and this work was conducted with the collaboration of Utah State University, Birkbeck (London) and Bristol University along with scientists from the University of Southern Denmark. Selenium isotopes from marine shales can act as a indicator of global oxygenation conditions. Lighter Se (selenium) isotopes recorded in shales generally indicate more oxygen rich conditions. So by measuring the different selenium isotope ratios recorded in rocks of different ages, the scientists can start to build up a picture of the amount of O2 on the planet, specifically the level of oxygen in deep water, which in turn reflects on the amount of oxygen likely to exist elsewhere on the planet such as near to the coasts and in the atmosphere. The selenium isotope analysis revealed that it took over 100 million years for the amount of oxygen in the atmosphere to climb from less than 1% to over 10% of today’s current level (20.8%). Specifically the researchers focused on looking at strata laid down during the Cryogenian (720-635 million years ago) and Ediacaran (635-542 million years ago), towards the end of the Neoproterozoic. During the period studied, three big glaciations –the “Snowball Earth” Sturtian (about 716 million years ago), and the Marinoan (635 million years ago) glaciations and the smaller Gaskiers glaciation (about 580 million years ago) occurred in which much of the planet (if not all of it), was covered in ice with the seas frozen and glaciers dominating the land. As temperatures dropped, so the conditions for life that did exist at the time became extremely harsh. However, when the temperature of the Earth rose, the glaciers melted and released vast quantities of mineral nutrients into the oceans. The research team hypothesise that the ice melt and increased nutrient mix in the sea helped cause oxygen levels to rise in the deep ocean. Increased oxygen due to glacier melt. Increased nutrients in a marine environment leads to more ocean plankton, which will bury and trap organic carbon in sediments at the bottom of the sea when they die. Burying carbon results in oxygen increasing, dramatically changing conditions on our planet. Up until this paper was published, oxygenation was thought to have occurred after the relatively small Gaskiers glaciation melted in the middle of the Ediacaran. The findings from this study suggests that oxygenation occurred much earlier, linking a rise in O2 levels to the Marinoan glaciation, after which animals began to flourish in the improved conditions. As life flourished so more and more diversity came about. This led to the Cambrian explosion, a burst of evolution that began around 542 million years ago. To read an article (2012), that looks at some of the world’s oldest fossils: Are these the oldest fossils known? The film actor and producer Nicolas Cage, he of films such as “Lord of War” and “Con Air” has agreed to return a rare dinosaur skull back to the Mongolian Government. The Oscar-winning actor purchased the skull back in 2007, unaware that the specimen he had bought was stolen. The Upper Cretaceous cranial material is from an Asian tyrannosaur, Tarbosaurus bataar, a close relative of the famous North American dinosaur Tyrannosaurus rex. At the time of the purchase, it was reported that Mr Cage had out-bid fellow Hollywood “A-lister” Leonardo DiCaprio for the mounted skull fossil. Mr Cage purchased the skull for $276,000 USD (£185,000 GBP) from a Beverley Hills gallery (I. M. Chait), he was subsequently issued with a certificate of authenticity by the gallery. U.S. Customs officials have not accused the actor or the gallery of any wrong doing. Unwittingly caught up in fossil thefts. A publicist for Mr Cage, Alex Schack commented that the actor had been contacted last year by officials from the Department of Homeland Security and informed that the skull was most likely illegally smuggled out of Mongolia. The removal of artefacts and other items of “cultural significance” has been outlawed in Mongolia for decades, in fact, we at Everything Dinosaur believe that this law was in place before T. bataar was officially named and described (1955). The office of Preet Bharara, U.S. attorney in Manhattan, filed a civil forfeiture complaint last week to take formal possession of the tyrannosaur skull material. Preet Bharara had acted in 2012 as the prosecutor in the case involving Florida resident Eric Prokopi, who was found guilty over the falsifying of import documents related to a Tarbosaurus fossil skeleton that he had arranged to ship into the United States. Mr Prokopi was imprisoned for his actions but as part of his guilty plea he helped U.S. Customs recover a further seventeen dinosaur fossils that had been smuggled out of Mongolia. At the time this first article was posted (May 2012), Everything Dinosaur along with other vertebrate palaeontologists and dinosaur fans supported a petition to stop the auction taking place. To read an article about the seizure of the Tarbosaurus specimen (June 2012): Seizing a Tyrannosaur! It is unclear whether Mr Cage or his associates had any dealings with Mr Prokopi. The I. M. Chait gallery has previously purchased and sold an illegally smuggled hadrosaurid dinosaur skeleton which had been procured from Mr Prokopi. A tale of the tape for two tyrannosaurids. Well Mr Cage, here’s one “National Treasure” heading home to its rightful owners.